Antonio Lamb transferred to UC Santa Cruz from the University of Hawaii to study marine biology, but he soon discovered a passion for molecular biology and biotechnology. Inspired by professors such as Jeremy Lee and Michael Rexach in the Department of Molecular, Cell and Developmental (MCD) Biology, Lamb grew increasingly interested in both the concepts of genetics and molecular biology and their practical applications in biomedicine and other areas. He became a regular at BioCurious, a community "biohacker" space in Sunnyvale, where he experimented with plant tissue culture and other techniques. He even bought some used equipment on eBay and set up a laboratory in his garage so he could practice the concepts he was learning in his classes. Lamb's DIY approach to molecular biology seems to be paying off. After graduating in June 2015 with a B.S. 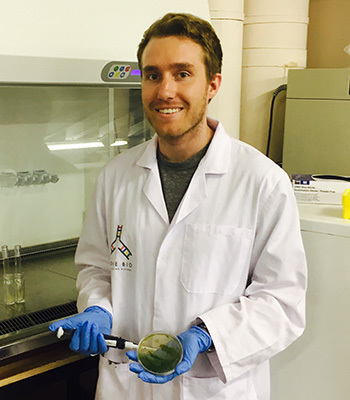 in MCD biology, he cofounded a biotechnology startup company, Microsynbiotix, which recently won $100,000 in seed funding from IndieBio EU, a synthetic biology accelerator program. In addition to a $50,000 cash investment, IndieBio is providing the company with laboratory space and equipment in a biotech incubator at University College Cork, Ireland, as well as mentorship and other services. Lamb is now in Ireland working on a proof-of-concept project to demonstrate the feasibility of the company's plan to produce oral vaccines for farmed fish using genetically modified microalgae. "It doesn't surprise me that he's doing this," said Jarmila Pittermann, associate professor of ecology and evolutionary biology, who had Lamb as a student in her plant physiology class and was struck by his curiosity and sincere interest in the material. "He would regularly ask questions after class, and he was especially interested in the molecular aspects of plant physiology. He impressed me as someone who is very creative, and looking for novel ways to solve problems." "He's totally unconventional," said Rexach, who had Lamb in his advanced cell biology class. "He was very inquisitive and seemed especially interested in learning how to do things. I never got the impression he wanted to get an A. He just wanted to learn how to manipulate the biochemistry of organisms." Through connections he made in the biohacker community, Lamb met scientists interested in microalgae as a biotechnology platform for producing oral vaccines, including Simon Porphy, a biochemical engineer with expertise in algal fermentation, and Jeffrey Boore, an adjunct professor at UC Berkeley and CEO of Genome Project Solutions. They launched a project on the crowdfunding platform Experiment that eventually led to the founding of Microsynbiotix. Their focus now is to develop a working prototype to demonstrate that protein production in algae is a viable approach for making oral vaccines for aquaculture. Bacterial and viral diseases are a serious problem in aquaculture operations, requiring the use of antibiotics to control disease or costly vaccination procedures that involve injecting each fish individually. "Effective and affordable oral vaccines could reduce the risk of devastating diseases that can destroy entire stocks of farmed fish," Lamb said. "With microalgae genetically modified to express oral vaccine proteins, the algal cells serve as the delivery vehicle, because algae are a natural part of the diet for the fish." Genetically engineered microorganisms have been used since the 1980s to produce proteins such as insulin for medical use. Using algal cells as the protein factories, rather than bacteria or yeast, is relatively new, but Lamb says it is now feasible and economically viable. For the proof-of-concept project, he said, the company is inserting a gene for synthetic insulin into the chloroplasts of microalgae, where the protein can accumulate to high concentrations without disrupting cellular functions. Through the IndieBio EU accelerator program, the company hopes to attract the interest of investors in the aquaculture and pharmaceutical industries, Lamb said. His pathway into the biotechnology industry has not followed the usual route. The traditional path for a student interested in a field like molecular biology would be to earn a Ph.D., followed by a postdoctoral fellowship, and then they might land a faculty position or a job in industry. Lamb's approach has more in common with the Silicon Valley startup culture, Rexach said. "I think what he's doing is good," he said. "I'm impressed." Lamb calls his nontraditional path a new model for funding scientific research. "Crowdfunding is now a viable system for funding research projects," he said. "And organizations like IndieBio and Y Combinator offer opportunities for funding that students and entrepreneurs can take advantage of."